Before Judy Garland, became Judy Garland she was Frances Gumm. She was named after her parents, but was called ‘baby’. Frances was the youngest child of Ethel and Frank, two vaudevillians who ran a movie theater. 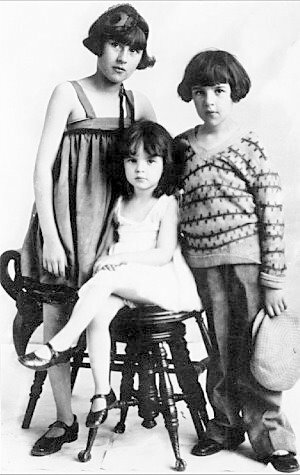 Frances and her two sisters proved to be just as gifted on stage as their parents and they became The Gumm Sisters, performing on stages while their mother accompanied them on the piano. Ethel became their manager and tried to get her daughters in movies. It worked and they made appearances in a couple of films between 1929 and 1935. In 1934 they performed in a theater with George Jessell, who encouraged them to change their name. They chose Garland and became The Garland Sisters and ‘Baby’ Frances subsequently decided to change her name to Judy. Judy Garland was born. 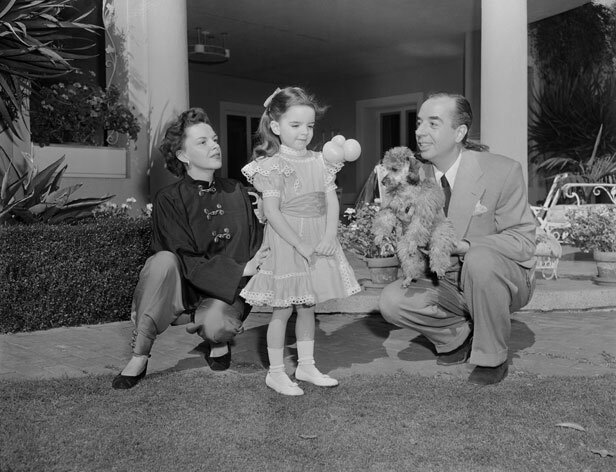 After Louis B. Mayer, the head of the MGM studio, heard about little Judy’s big voice, he invited her and her mother to the studio. She was immediately signed. Soon after, The Garland Sisters broke up, when oldest sister Suzanne got married. But despite the promising start the studio did not know what to do with Judy. 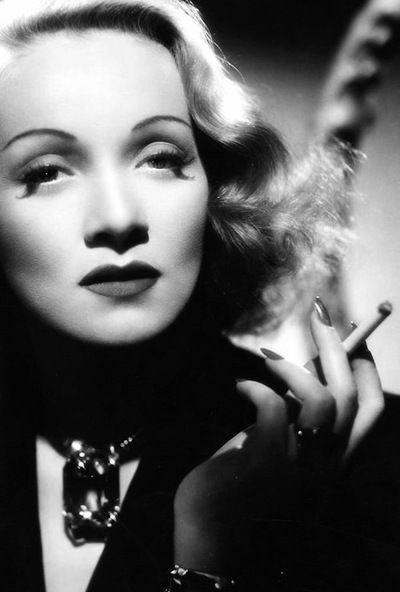 Her looks did not fit the glamour queens that they were used to and Mayer even called her his ‘little hunchback’. Eventually they decided to give her a ‘girl next door’ image. On November 16th 1935 Judy’s father was taken to the hospital for meningitis, while Judy was preparing for a performance on a radio show. The following morning Frank died, leaving Judy devastated. In 1937 MGM finally found a good place for Judy: they teamed her up with Mickey Rooney. She literally played the girl next door in three Hardy Family movies and they proved to be a successful pairing. Mickey and Judy would remain lifelong friends. Meanwhile the schedule was so grueling MGM was giving its young stars amphetamines and barbiturates, to keep them working during the day and to put them to bed at night. But all her hard work paid off when in 1938, at the age of sixteen, Judy got the part that made her a star: Dorothy in The Wizard of Oz. She received a special juvenile Oscar for the role and MGM kept the momentum going by putting her in one film after another. After playing another youngster in Ziegfield Girl in 1941, Judy was ready for adult roles. This was the case in her personal life as well. She had a short romance with Artie Shaw and in 1941 she married musician David Rose. She started playing adult roles such as in Me and My Gal featuring Gene Kelly. But her marriage was not a happy one and in 1944 Judy filed for divorce. In that same year, Judy starred in one of her most popular films: Meet Me in St. Louis. She fell in love with its director Vincente Minnelli and the two got married in 1945. The couple was initially very happy together and in 1946 Judy gave birth to her first child: Liza Minnelli. She suffered from postpartum depression and did not make another film for a year. But in 1947 she had to get back to work and started filming The Pirate with her husband. She suffered a nervous breakdown on set and was placed in a sanitarium. Although she was able to complete filming, her mental health was still unstable and she relied heavily on the prescripted drugs MGM had introduced her to. Still, Judy managed to complete three more films for MGM: Easter Parade, In the Good Old Summertime and Summer Stock. In the meantime she had gotten suspended by the studio twice for her behavior on the set of two films: The Barkleys of Broadway and Annie Get Your Gun. She did not show up on set a lot of days and her behavior was unpredictable, as she was not only addicted to pills but by now also relied on alcohol. In 1950 MGM had had it when she did not show up on the set of Royal Wedding and they suspended her contract. At 28 Judy was unemployed and her marriage was unraveling. Rumor has it, she made one of her reportedly frequent suicide attempts. In 1951 Judy and Vincente divorced. A little while later she met Sid Luft, they instantly hit it off and he became her manager and fiancée. 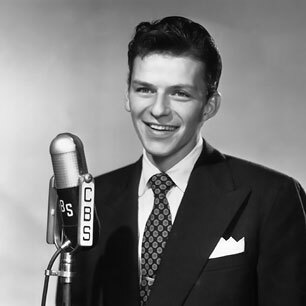 His first act as manager was arranging a four month concert tour in The United Kingdom, which was a big hit. She also made an appearance on Broadway, but had to stop performing when she found out she was pregnant. Sid and Judy got married in 1952 and in November of that year their daughter Lorna Luft was born. Although she suffered from postpartum depression once more, good news was on its way: Sid had arranged for Judy to star in the musical remake of A Star is Born. By now, Judy and her mother were estranged and she refused to let Ethel see her new granddaughter. A couple of months later Ethel died of a heart attack. 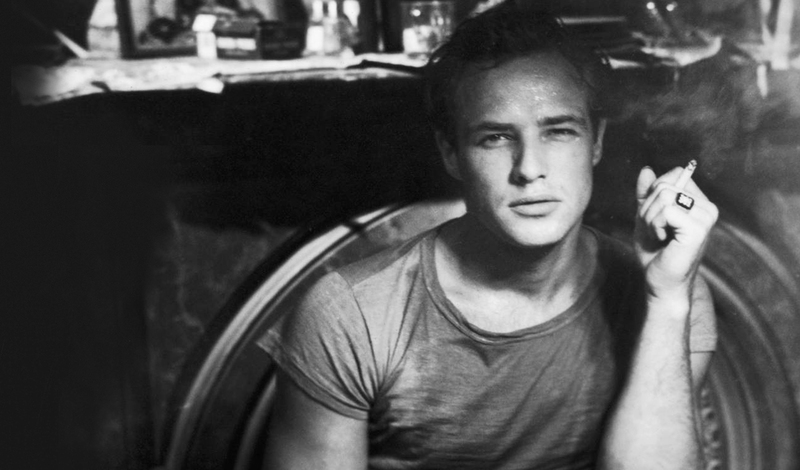 In 1954 the shooting of A Star is Born began. But filming went over budget and although it was met with critical and popular acclaim, a lot of money was lost. In the beginning of 1955 Judy gave birth to her first baby boy and last child: Joey Luft. Subsequently, she made a number of popular television specials and performed in Las Vegas. In November 1959 Judy was hospitalized with acute hepatitis, she was very sick and was told she would remain a semi-invalid. But Judy proved them wrong, recuperated and started performing again. In 1961 one of the highlights of her career took place: a concert at Carnegie Hall. Its two record cd Judy at Carnegie Hall was certified gold and won four Grammy’s. In that same year she starred in her first film in years: Judgment at Nuremberg, for which she received an Oscar- and Golden Globe nomination. Her struggle with drugs and alcohol continued, but her career was back on track. 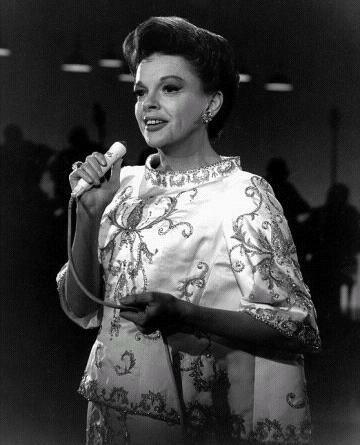 In 1962 she made The Judy Garland Show for TV and she continued to do a handful of films in the following years. In 1963 she filed for divorce from Sid, citing ‘cruelty’. They had separated before, but had always reconciled. But in 1965 their divorce would be final. Sid’s gambling addiction had cost her a lot of money and after the ending of her television show, she went back to the stage. In 1965 Judy married her tour promoter Mark Herron, but they separated after five months. In 1967 she was cast as Helen Lawson in Valley of the Dolls, but she missed so many rehearsals that she was replaced by Susan Hayward. She moved to London and married musician Mickey Deans in March 1969. Judy continued to perform, sometimes with her children. On June 22nd 1969 Deans found Garland in the bathroom of their house in Chelsea. She had passed away at 47. The subsequent inquest stated it was due to ‘an incautious self-overdose of barbiturates’. See her life in pictures in the Judy Garland Gallery.